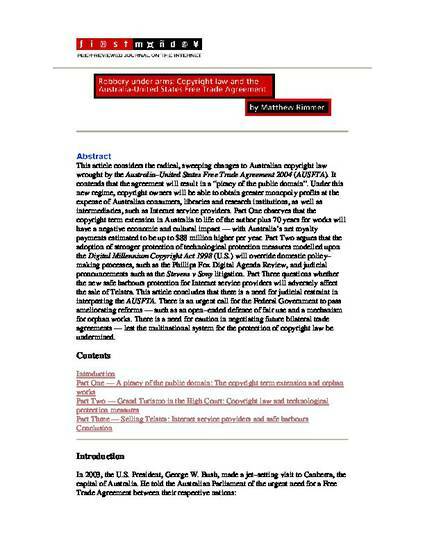 This article considers the radical, sweeping changes to Australian copyright law wrought by the Australia-United States Free Trade Agreement 2004 (AUSFTA). It contends that the agreement will result in a "piracy of the public domain". Under this new regime, copyright owners will be able to obtain greater monopoly profits at the expense of Australian consumers, libraries and research institutions, as well as intermediaries, such as Internet Service Providers. Part One observes that the copyright term extension in Australia to life of the author plus 70 years for works will have a negative economic and cultural impact - with Australia's net royalty payments estimated to be up to $88 million higher per year. Part Two argues that the adoption of stronger protection of technological protection measures modelled upon the Digital Millennium Copyright Act 1998 (US) will override domestic policy-making processes, such as the Phillips Fox Digital Agenda Review, and judicial pronouncements such as the Stevens v Sony litigation. Part Three questions whether the new safe harbours protection for Internet Service Providers will adversely affect the sale of Telstra. This article concludes that there is a need for judicial restraint in interpreting the AUSFTA. There is an urgent call for the Federal Government to pass ameliorating reforms - such as an open-ended defence of fair use and a mechanism for orphan works. There is a need for caution in negotiating future bilateral trade agreements - lest the multinational system for the protection of copyright law be undermined.